Philseok Kim held up a pair of small translucent glazing — rectangular and slender — steadying it by the corners the way one would a camera. Behind him, the bright light of morning sun streamed through his laboratory office window, passing through the glazing and into the room. “Now watch this,” said Kim, Ph.D., a Senior Research Scientist at Harvard’s Wyss Institute for Biologically Inspired Engineering. His fingers ever so slightly nudged one side of the glazing up, and the other down. The light suddenly scattered, softening in intensity, most of it now radiating above and behind where it had been. This video shows a shoebox model of the novel Dynamic Daylight Redirection System developed by the Wyss Institute and Harvard Graduate School of Design. What Kim did was apply a miniscule amount of shearing to slightly bend an array of tiny walls between the glazing to shift position in unison, altering the angle at which the light hits them. These dynamically bending tiny walls made of transparent rubber cause incoming light to change direction and diffuse by guiding, reflecting, and refracting it. “Just by applying a little bit of shear force, you can achieve an enormous effect in how this light is guided,” said Kim, who works with Wyss Institute Core Faculty member Joanna Aizenberg, Ph.D., on the Wyss Institute’s Adaptive Material Technologies (AMT) platform. A sunny day is pleasant, even at work, but not for those sitting near their office windows where glare obscures their computer screens. Meanwhile colleagues far from the windows have the converse problem of sitting in the dark. Common sense in America and around the world has been to draw the shades and turn on the lights, so all can see no matter where they sit. It has also been economically and ecologically costly, with vast quantities of electricity and pollution generated to light buildings when it is light outside. Researchers at the Wyss Institute and the Harvard Graduate School of Design (GSD) have a better idea, which they report in the online edition of the journal Building and Environment. Kim’s glazing is one of many designs they are developing of a dynamic daylight redirection system: installing a larger version of the glazing between the panes of a double-pane window at the top portion only in order to redirect the light entering a building. This increases the amount of light farther from the window and decreases the amount closer, all while reducing glare. The models used in the research show great promise for energy efficiency. 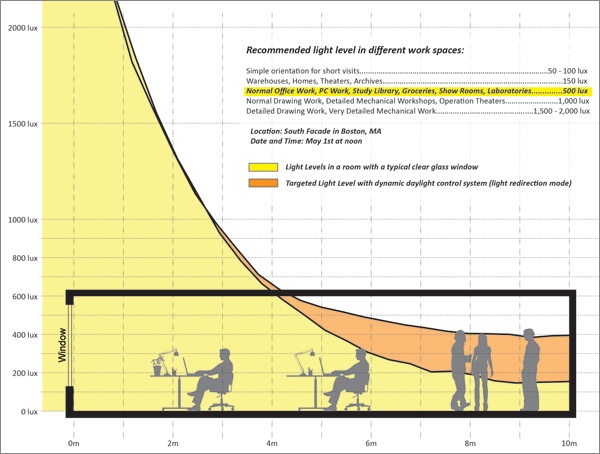 Targeted daylight level distribution within a typical office space using Dynamic Daylight Control System (DDCS). The systems could be used in existing and new windows and be manually controlled or programmed to automatically redirect light with actuators — adjusting the interior light as the exterior light changes through the day and year. Kim said it might be possible to integrate the systems with smart materials such as hydrogels that expand and contract with changing light, enabling the systems to autonomously control themselves. The systems could be made with various materials as well and become fully transparent when filled with index-matching fluids. Rather than expensive or static like current artificial lighting systems, these would be cost-effective and dynamic. “We’re always looking at performance and efficiency, but we’re equally interested in questions of design and in what new material systems mean for the overall building,” Bechthold said, noting that about 40 percent of America’s energy is consumed by commercial and residential buildings, largely for lighting. The research is part of broader work at the Wyss Institute on adaptive material technologies, led by Aizenberg, and is the first journal publication from the Adaptive Living Environment (ALivE) project, a collaboration between AMT and GSD supported by Wyss Institute. This project is one of many efforts in collaboration with GSD to design “smart” adaptive windows that efficiently distribute daylight and reduce energy loss.